A dramatic tale of revenge, ‘Heavenly Sword’ follows the story of Nariko (Torv), a trained warrior who possesses a sought after blade with incredible powers. As the sword’s guardian, she must face a power-hungry ruler King Bohan (Molina) and his unyielding army, who are determined to obtain the powerful sword for themselves. The DVD is packed with bonus footage including behind-the-scenes interviews with the cast and filmmakers. 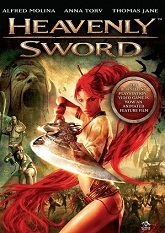 Heavenly Sword Trailer #2 from TriCoast Studios on Vimeo.